It may seem like a straightforward question, with an equally straightforward answer, but the modern advertising agency is more complex than it actually sounds. However, before diving into the meat and potatoes of the topic, let's first look at the generally accepted definition of an advertising agency. An advertising agency creates, plans and manages all aspects of a client's advertising. 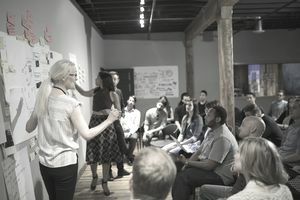 Advertising agencies can specialize in specific areas, such as interactive advertising, or they can be a full-service agency that creates advertising materials like websites, online and social campaigns, brochures, catalogs, direct mail, print ads, radio and TV commercials, sales letters, and more. These are the big agencies that handle the prime accounts and create the national (and even international) advertising campaigns that take a significant chunk of the client's budget. Big TV campaigns, outdoor, magazines, newspapers, and non-traditional media (stunts, guerrilla campaigns). These agencies don't have the budgets or recognition of the ATL agencies, but they are still vitally important to the media mix (even more so these days with online being so prevalent). BTL agencies typically handle direct mail, regional ads, text ads, online text and banner ads, and other smaller media placements. However, they will sometimes handle ATL type of accounts too, although it is not their bread and butter. Perhaps the most common of the three these days, TTL agencies are a blend of ATL and BTL. They will create campaigns from soup to nuts, from the big stunts, outdoor, TV and radio, right down to microsites and coupons. TTL agencies are so common nowadays due to the rise of social media, and the smart phone. Tactics that were once considered BTL are getting big budgets put behind them, including campaigns on SnapChat, YouTube, Facebook and Twitter. These agencies have a primary focus on all things digital. They develop websites, apps, online campaigns, and anything else considered "digital advertising." While they can also produce print, radio and even TV, their day-to-day operation is all about digital. There is a need for specialists that focus on just healthcare products and services, because these areas can be a legal nightmare to handle. Healthcare ad agencies will handle pharmaceutical accounts, hospitals, medical equipment, and anything else that would be considered too niche for a traditional ad agency. Just like healthcare, the worlds of finance and technology can be a minefield to negotiate. These agencies have specialist writers and art directors who know the ins and outs of these subjects. These agencies are based within a corporation or company, and do work only for that entity. Whether it's a big brand like Apple or Nike, or something much smaller, they work exclusively on that product or service, and are employed by the company they advertise for. Some people consider this to be "selling out" because you are no longer working on a diverse range of brands, but in house agencies produce some breathtaking work. Typical employees found at an ad agency include the agency president, creative director, account executives, copywriters, graphic designers and a media director. Some agencies also work with freelance copywriters and/or freelance graphic designers who usually do not work on-site. More often these days, smaller ad agencies will grow and shrink based on client projects, employing contractors to work on an hourly, daily, or project-by-project basis. This is not a typical 9-5 job, and most employees will be asked to work long hours, and weekends, from time to time. It is a stressful environment, and layoffs are common. Typically, if a client pulls an account from the agency, layoffs will follow. Clients can be very demanding, and employees can be asked to drop everything to work on an urgent project. It's a creative environment, and mixes a lot of fun with some great opportunities to travel, meet famous people, and even put your feet up while drinking a beer and thinking of crazy ideas. Many agencies have "fun" areas that allow the staff to enjoy a game of pool or darts, relax in bean bag chairs, and even take a nap. The pay can be excellent, and some agencies will give you unlimited vacation days (although you will rarely get a chance to use them).